The Monte Rosa ski area covers three parallel valleys in the Aosta region. Each valley has ski resort villages and facilities for motorhomes so all we had to do was decide which valley we would drive up. The Lys Valley was our choice, also known as the Gressoney Valley after two of the villages in it’s upper regions. Historically this valley was populated by the Walser, a Germanic people who migrated to various areas of the alps in the middle ages. The local buildings reflect the Walser style and there is even a local Germanic dialect called ‘Titsch’. 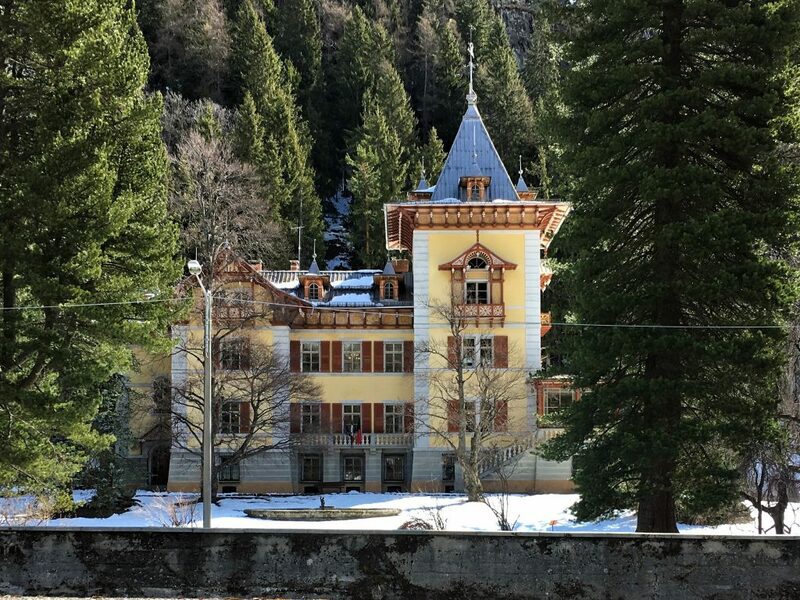 We made our way past the fortress of Bard – where the very interesting museum of the Alps is located – and overshot the junction to the Gressoney valley in a search for some more GPL as we had nearly depleted one tank during our stay in Cervinia. After a successful purchase of gas we backtracked to the town of Pont-Saint-Martin and after missing the junction once (it was a hairpin turn we weren’t expecting) finally got on the valley road. The drive up the Gressoney valley was highly scenic. After the familiarity of the Aosta valley it was nice to get somewhere new and see our surroundings with fresh eyes. 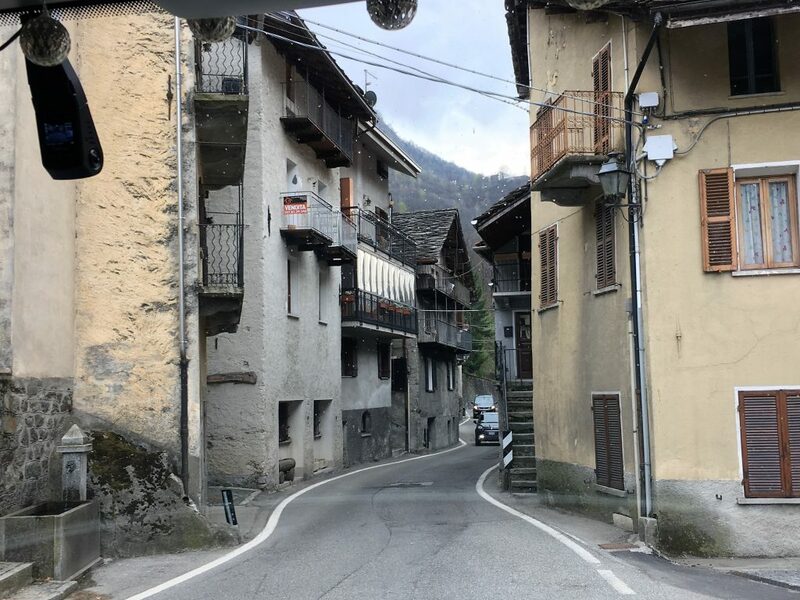 Although the road was very good it did narrow down as we drove through the villages and we could see where balconies had been removed from buildings to allow high vehicles through. None of these constrictions were controlled by lights so you need to keep an eye on the road ahead. I’m told that breathing in doesn’t help but I do it anyway. Narrow village roads – if you’re in a right hand drive you’ll want someone in the passenger seat to look ahead for you. At some point we crossed a line taking us from green spring pastures to monochrome winter landscape. The rain that had fallen on us the previous day had dropped a new load of snow across the valley floor and over the steep mountains. Our destination was the small hamlet of Staffal (or Tschaval) at the head of the valley. This is where the road ends and also where the main ski ifts are. There is a sosta up here, but we anticipated it might be under snow and we were right. What we hadn’t anticipated was that it would be completely closed. The barrier was down and a phone call to the owner/warden resulted in a very definite ‘Chiuso’, we weren’t getting in. What a shame, quite often out of season we have found Italian sostas to be closed, but usually they just leave the barriers up and turn all of the services off (sometimes they don’t even turn the services off), at least providing some motorhome parking. This time there was no way we were getting in. There is a large free parking area at Staffal, but it was full to the brim, including a disproportionate number of Belgian cars; we never did find out why but there were two Belgian coachloads of school kids and another 20 or so Belgian cars. The paid parking was pretty much empty but the spaces were too small for Bertie. In the end we followed the road slightly downhill from the lifts to find some parking on the side of the road, it was sloping but free and spacious. It would do while we went skiing. We had an awesome afternoon of skiing on an afternoon ticket, covering the Alagna side of the valley. There were hardly any other people on the slopes but we did surprise one black squirrel who barely made it across the slope without being sliced by my skis. By the end of the afternoon the slopes had started to slush up but it wasn’t too bad. The following morning we got up nice and early to ski the other side of the valley and over to Champoluc. It was busier on this side of the resort but that didn’t stop it being another great day, although the sun started to soften the slopes a bit earlier. We even managed to do the black runs without having sized them up from a ski lift, our confidence was really improving. 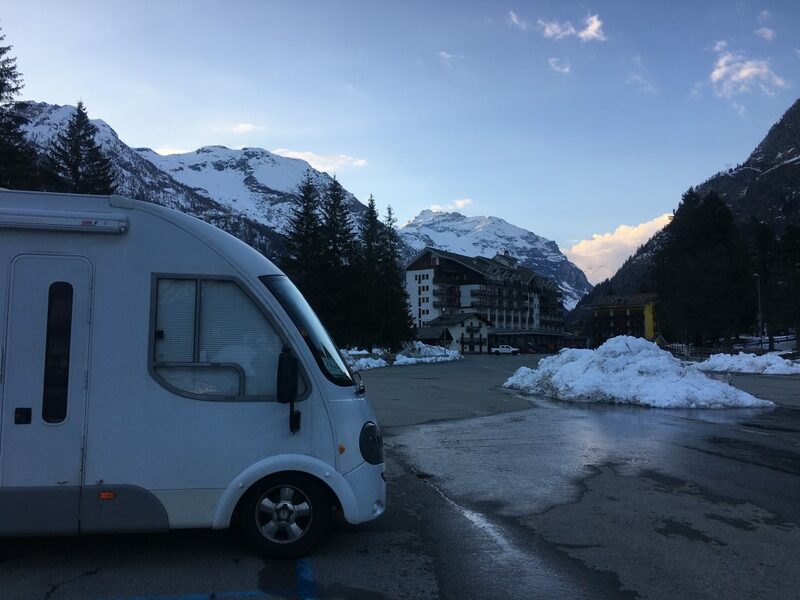 Between ski days we had moved to the free parking area and got ourselves parked up in a reasonably level position with magnificent views of the Monte Rosa massif to accompany our dinner. 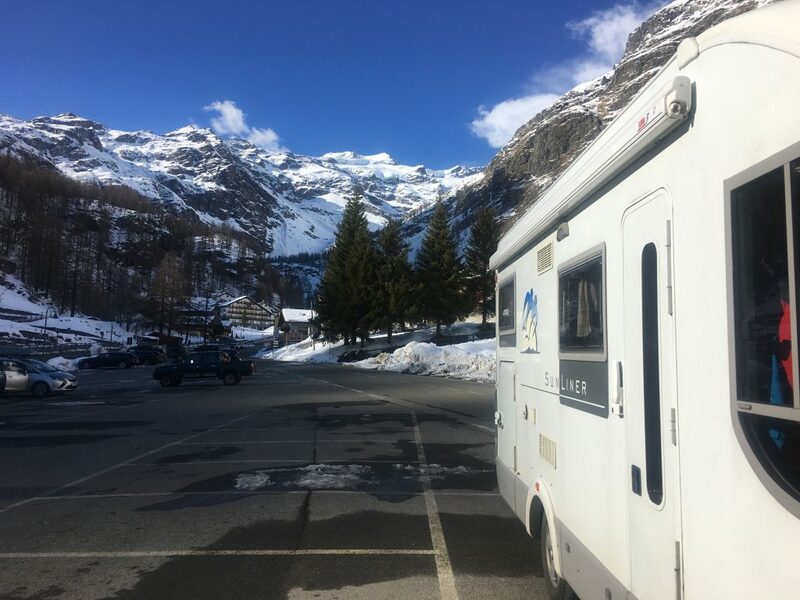 For the second evening we decided to move down the valley to Gressoney-Saint-Jean where there is a decent sosta with services and electricity. On the Wednesday morning the light was dull and the tops of the mountains grey, we decided that we wouldn’t spoil our memories of Monterosa with a ‘meh’ day of skiing so instead we stayed down in Gressoney-Siant-Jean and had a wander around the pretty village centre with it’s traditional buildings and shops full of gourmet tourist treats. We will definitely be back here for some more skiing and some hiking. The sosta in Staffal is the best positioned overnight spot for parking and accessing the slopes, just a 300m walk up a gentle hill to the lifts. It’s a shame it was shut as I wouldn’t have minded the fee of €12 per night (plus €3 if you want electricity and a few extra cents for tourist tax). There are also toilets here although I think they might have a small cost per use and a useful and sheltered information area. The payment is made to the warden if they are there. We stayed in the free parking for the Staffal lifts without any issues although the police may have moved us on if the sosta had been open. Further down the valley in Gressoney-Saint-Jean there is motorhome parking in the main car park. The spaces are delineated in blue at the back of the car park, the blue lines mean that you have to pay, although it’s free in the low season. Payment is made at the machine (we thought our luck was in as the machine was out of order, but they just haven’t taken away the old machine and the new one is working just fine). Electricity is included in the price and there are also toilets here as well as a heated water and waste disposal area. If you park in Staffal then it’s a short walk to the slopes or a very short trip on the free ski bus. If you park in Gressoney-Saint-Jean then you are already at the lift station for this very small ski area which is covered on the Monte Rosa ski pass. A free ski bus runs to Staffal. The Gressoney-Saint-Jean ski area closes at the end of March and this is also when the free bus stops. A paid bus service still runs up to Staffal but it would be more convenient to just drive up each day. Staffal is really just the ski station and a bunch of hotels, restaurants and ski hire shops. There is one deli/bread/sandwich shop under the Hotel Nordend. 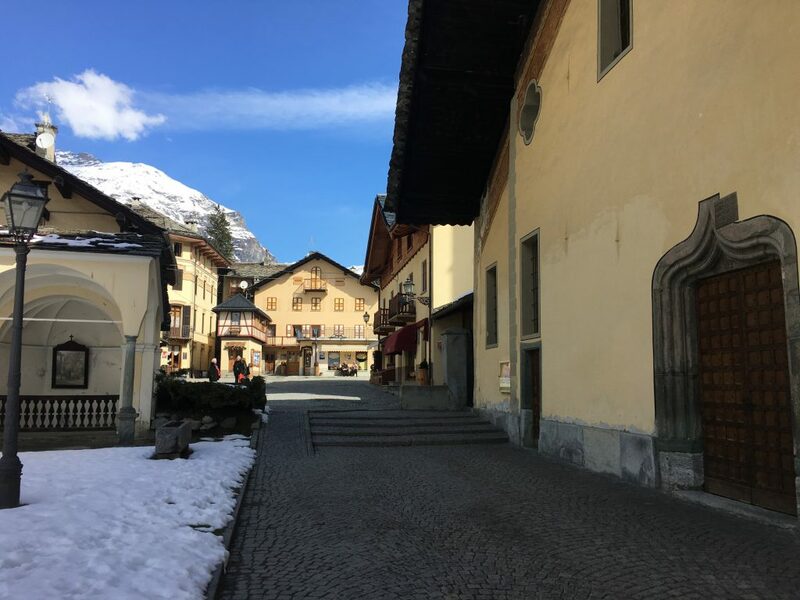 For more services you need to head down the valley to Gressoney-le-Trinite or to Gressoney-Saint-Jean where there are a couple of shops. There is also a swimming pool at Gressoney-Saint-Jean and it’s a very nice little village if you want to do some sight seeing. Ski passes include 3 hour, 4 hour, morning or afternoon passes as well as the usual day and multi day passes. Lift passes are credit card style contactless passes and you have to pay €5 per person for the card. You get this deposit refunded if you return the card to the ticket offices. You can pay an additional €3/person per day for insurance to cover you for rescue from the slopes in case of an accident (not any other medical costs though so you still need proper insurance). Staffal seemed like a good option for a base because it’s in the central valley, however it’s pretty easy and quick to get across all three valleys so it really doesnt matter. Each valley also has at least one small resort that is included on the Monte Rosa lift pass but is not connected by lifts. Because of the orientation of the slopes you will find that most either face east for the morning sun or west for the afternoon sun. There are a few slopes at other orientations and one slope (Sarezza-Contenery) from the top of the Champoluc side that we found got very little direct sunlight and stayed in good condition for a lot longer than the other slopes (it still held powder on our second afternoon, over 48 hours since the last snowfall). Unfortunately it’s quite narrow and steep at the top and got clogged up with nervous skiers at times (it was the only open route back to Gressoney). The Monte Rosa slopes are mostly reds, there is very little here for progressing beginners. But for confident intermediates it’s great because although there aren’t loads of runs they are very long and wide. Monte Rosa excels for off piste and ski touring. Not something we’re confident enough to enjoy without a guide but it looked amazing. Many of the people we saw on the lifts were equipped with harness, ice axe and jangling carabiners. The ski area was due to close on 14th April, but this is not a complete closure. This year the resort reopens for easter week and has a spring schedule for access to the Indren freeride area and the huts for ski touring. There are a number of marked ski touring/snowshoe trails on the piste map which were groomed in places and in other places just marked with poles. In the valley there are numerous walking routes. We’re looking forward to coming back and testing them out.